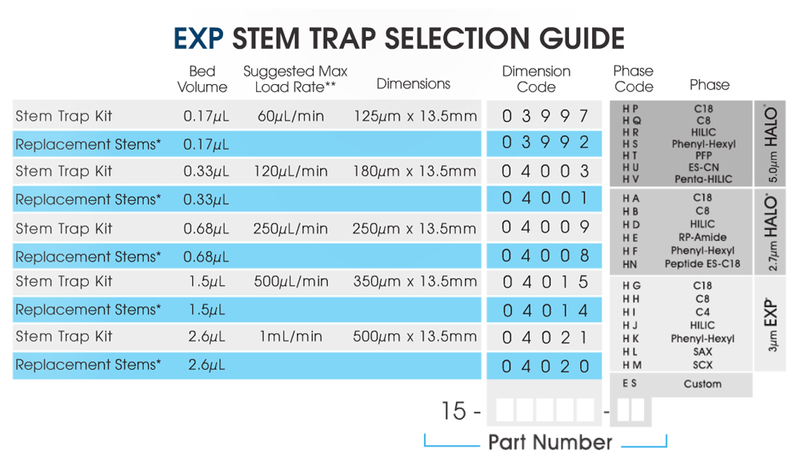 The entire EXP® Stem Trap and reusable holder are only slightly larger than a standard HPLC fitting. Its slim architecture allows it to easily fit into crowded instrument compartments or to connect directly to tightly-spaced injection ports. When tightened by hand, the EXP® Stem Trap seals to 8,700+ psi. All configurations incorporate wrench-flats to enable flawless sealing to 20,000+ psi (1,400+ bar). The unique packed floating stem installs directly into any 10-32 port and automatically adjusts to provide a perfect ZDV connection. The EXP® System enables chemists to quickly remove detergents or salts which can affect the ionization process in MS work. This trapping technique can concentrate the sample directly on-line, allowing for increased recovery of precious sample material compared to off-line techniques. On-line trapping readily lends itself to automation for high-throughput analysis in UHPLC/MS applications. Click the button below to add the EXP® Stem Trap to your wish list.